In my little city yard, I do not have space to do much gardening, but I always have pots of fresh herbs. Happily, my herb garden is exploding this summer. Due to the decent rains and mild temperatures, I have more mint, basil, and chives than I know what to do with. It appears to be a great year for many other summer favorites as well, much to the boon of the food lover. We are only on the verge of summer sweet corn season, but all the local corn I've had this year has been fantastic so far. Ditto for tomatoes. And can we talk about the melons this summer?!? I have had far better, more fragrant and juicy slabs of cantaloupe in the past month than anytime in recent memory. Even the honeydew melons, often the bane of the fruit salad bowl with their tasteless and often near-crunchy flesh, have been sweet and downright yummy lately. When late August hits and these garden treats are truly at their peak, no doubt that we are all in for a real feast. What to do with all these fine specimens from the fruit and vegetable garden? I think that one of the best ways to put the bounty of summer on display is to enjoy them simply adorned. One sees a lot of veggie platters at parties this time of year, but when those are freshly cut garden veggies (or farmers market veggies), they can be a lovely addition to a party meal - skipping the gloppy ranch dressing of course. The problem with the veggie platter, or crudit platter, is that it is pretty darn boring. Sure, we want to enjoy fresh, crunchy, raw veggies at their sweetest and most crisp, but sometimes, even nature needs a little help from time to time. I like to showcase fresh raw vegetables in a slightly fancier guise - the infinitely delicious summer roll. A summer roll is basically a handheld, dunkable salad. Vietnamese rice paper provides the exterior, and any fresh veggie imaginable supplies the inner workings. Rice paper is a great summer ingredient option because it requires no cooking, only a quick dip in warm water before it is ready to use. Rice paper is available in the ethnic aisle of most good supermarkets, also under the alias of rice pancakes or spring roll wrappers. It is gluten-free, fat-free, very inexpensive, and most importantly - super tasty with a great chew. The rice paper can be filled with just about anything - raw veggies, cooked chicken or shrimp, fresh herbs, etc. - and rolled up burrito-style. The rice paper is just sticky enough to seal itself up almost immediately. Summer rolls are perfect party food for a variety of reasons. They are super quick and easy to make, and more importantly, to make ahead of time. They are finger food, so they are easier to serve than a traditional salad, where there are always worries that the lettuce is getting wilted and soggy. They are infinitely customizable, both in terms of fillings and of condiments for dipping. Traditionally, summer rolls are served with some kind of soy sauce-based or sweet and sour-type dip. These are yummy sauces that register much higher on the light-summer-eating scale than heavy mayonnaise or dairy-based dipping sauces. -Use firm vegetables and proteins to avoid the soggy/messy curse (sorry tomatoes, you have no place here this time). Good veggies to use are cucumbers, peppers, green beans, snow peas, radishes, and carrots. Avocado is also an excellent addition, provided that it is not too mushy. -Cut veggies into easy-to-bite matchsticks. The whole point is that forks and knives are not necessary, only teeth. -Roll in some greens to provide color, flavor, and stability. I sometimes use tender green leaf lettuce leaves, but more often I roll the veggies up with a few whole leaves of basil and cilantro to make the flavors really pop. -Use less filling than you think is necessary - the summer rolls will be easier to roll up. In addition, wrap the rolls as tightly as possible to ensure an attractive, even shape. Although not necessary, adding a protein to the summer rolls make them both more delicious and substantial -- and may be necessary to coerce fervent meat eaters into trying the summer rolls initially. Cooked and chilled strips chicken or whole shrimp are obvious additions, but I have had great summer rolls with tofu, cooked crab, and sliced roasted pork. 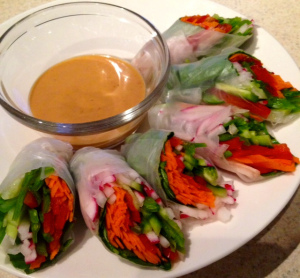 Another way to up the ante on the protein without adding meat is to serve the summer rolls with a peanut sauce. 12. Serve with dipping sauce of choice and watch them disappear! ***The pictured rolls feature basil leaves, carrot, red pepper, cucumber, snow peas, and radish, all sliced thin. The pictured dipping condiment is a Thai peanut sauce. These handheld salads can be works of art, almost (but not quite!) too pretty to eat. Experiment with different colors and types of veggies and crunch away on the rest of this beautiful summer!